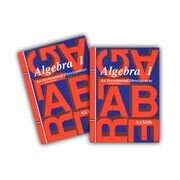 ***SAXON Algebra 1 Solutions Manual: Click here to purchase a discounted copy on the Bargain Basement. All Bargain Basement items are unused, current editions with cosmetic defects only. The hands-down favorite math program for students in 4th-12th grades! Each new skill builds on those previously taught, and daily review of earlier material increases understanding. The homeschool kit includes a hardcover Student Textbook, a booklet with Tests, and a complete Answer Key (including test answers). Eighth-Ninth Grade. Third Edition: Not Common Core revised! A Solutions Manual containing the step-by-step solution to each problem in the text is available separately, and is highly recommended.